Clayton had its beginnings in the early 1700s and was originally known as Stallings’ Station, a depot along the North Carolina Railroad. The name was not officially changed to Clayton until 1856. In 1869, the Town of Clayton was incorporated and has grown into a thriving community which is now the fastest growing town in Johnston County. Although it has experienced tremendous growth in the past 10 years, Clayton maintains a small-town charm that welcomes newcomers and visitors alike. Clayton is surrounded by a thriving industrial base and offers diverse recreational activities, numerous educational opportunities and a burgeoning cultural and visual arts community. Its citizens – who range from young families to retirees – enjoy the comfort and security of living within a small community and are able to take advantage of the benefits of living close to the major metropolitan Triangle area. Clayton’s public schools are a major factor in attracting residents. 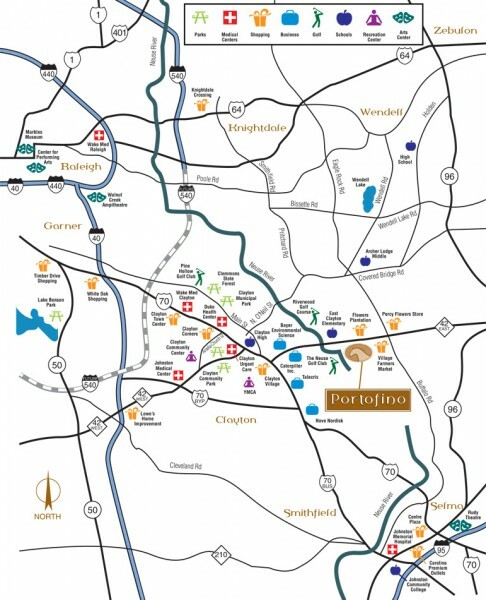 Schools near Portofino include East Clayton Elementary, Riverwood Elementary and Riverwood Middle School, River Dell Elementary, Archer Lodge Middle School and Archer Lodge High School, and Clayton High School. Business Week magazine has rated Clayton’s schools among the top in the United States and has ranked the town in the top 10 of the country’s most affordable places for families to live and assure a top education for their children. There are many colleges, universities and technical schools within commuting distance of Clayton, including North Carolina State University, The University of North Carolina at Chapel Hill, Duke University, Johnston Community College and Wake Technical College. Clayton is a burgeoning artists’ community. The Clayton Center, which features a 600-seat auditorium, was renovated from the former Clayton school buildings into a state-of-the art performance and conference center. The auditorium is home to a professional performance series and is also rented to local groups for pageants, concerts and presentations. The Clayton Center has quickly become a destination for both the business and civic organizations around the region. It’s also home to visual artist exhibitions throughout the year.